Well, one of the things that actually surprised me when Halo 4 came out was that there would be a new enemy species to fight against, called Prometheans. Right off the bat, I will say that this is a figure I would not have picked up at full retail price. The figure itself did not look particularly enticing in the package, but a 50% Off discount, it seemed like a good deal. At first. In game, the Watcher units are your standard swarm enemies, meaning they are not particularly hard to kill, but annoyingly fast and prone to call in tougher reinforcements. The Watcher design is suitably minimal, comprised by a proto-torso with a face, a propulsion unit and some small appendages at the front. 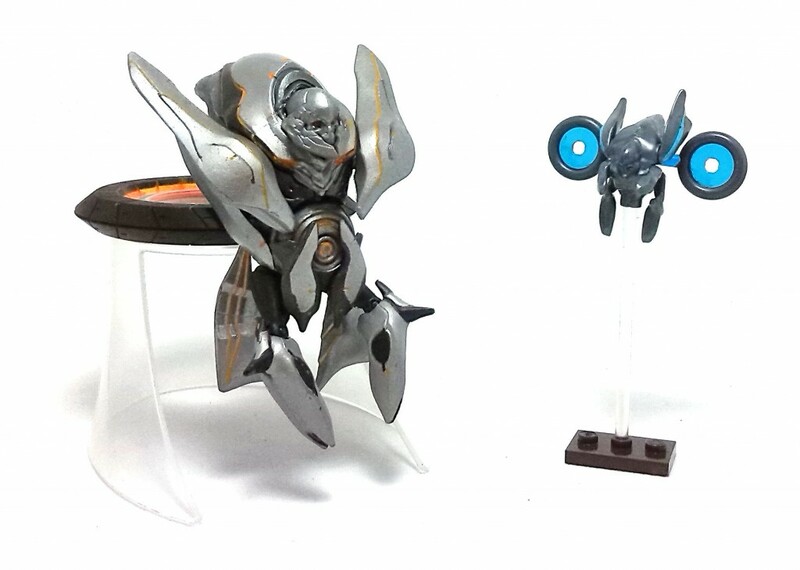 The overall design is sleek and is recognizable as the unit from the game, although it differs from the more common representations by having only one repulsor ring at its back, when the most common representation of these flyers has two and in a different configuration, one which the folks at Mega Bloks nailed perfectly on their blind bag Halo series. The McFarlane Watcher has a decent amount of articulation hidden in its design, none of which is especially useful given the unusual configuration of this construct. Most of it is found on the pair of small arms at its front, but also the curved surfaces at the sides and the “ear” pieces below them can be moved around a little bit. 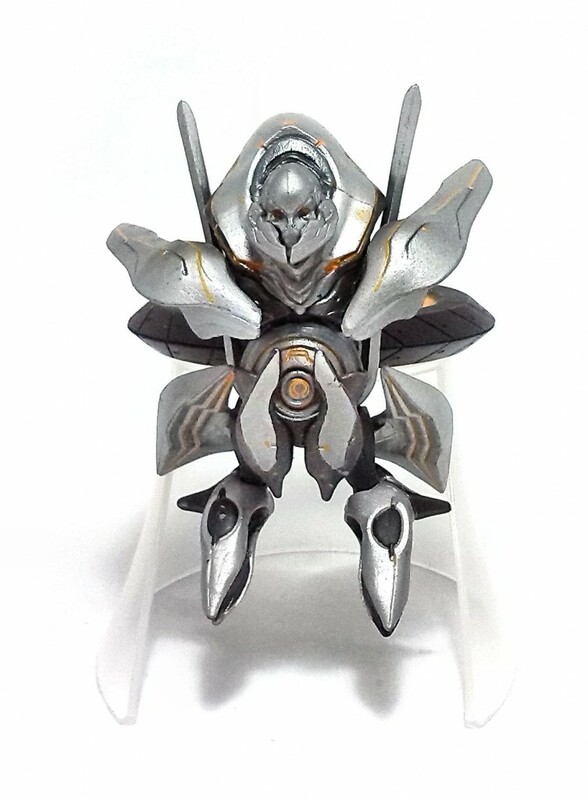 The color scheme on the Watcher is fairly simple. 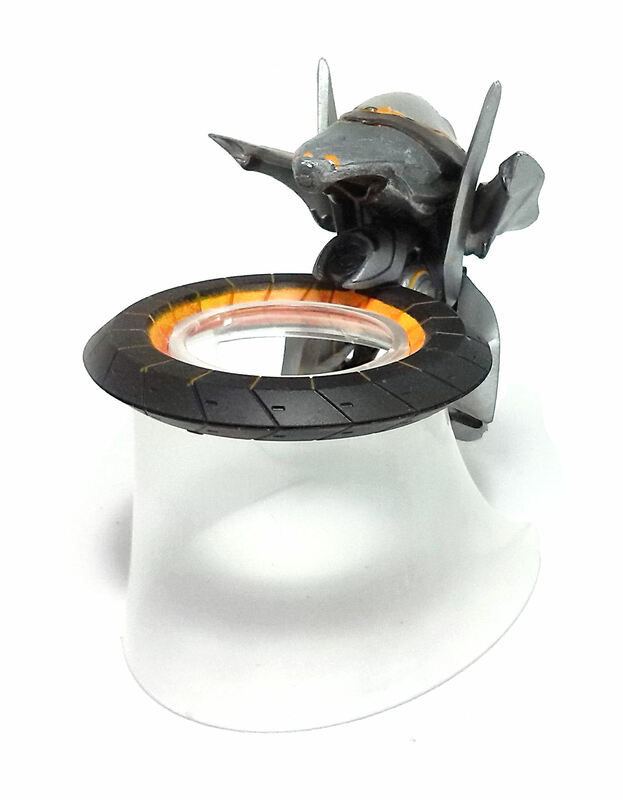 The body is painted silver with matte black painted onto the repulsor ring piece, with bright orange accents applied on both to unify their appearance. While the orange line work on the torso looks fine, the paint application on the inner side of the ring looks rather sloppy, with some very obvious brush strokes on the underside. 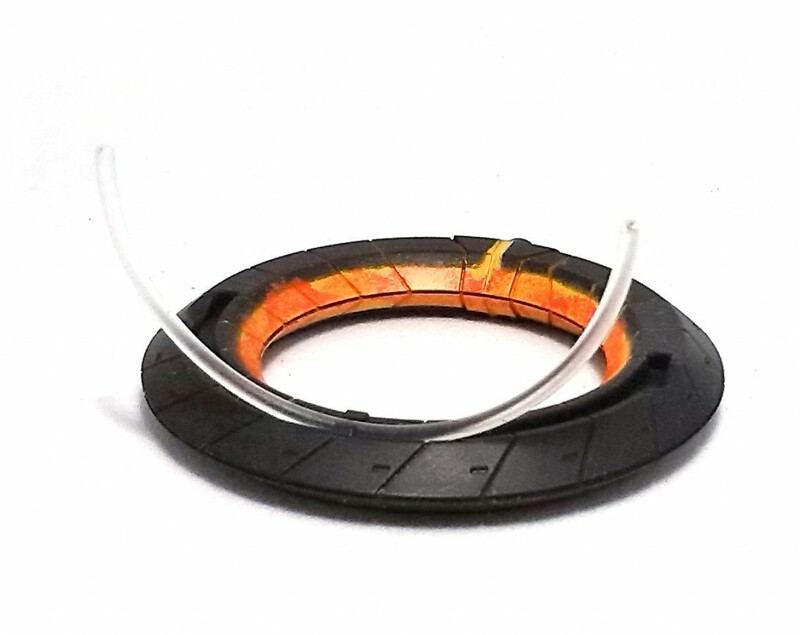 The repulsor ring is attached to the back of the watcher using an hexagonal peg, and the ring itself can be used to hold the Watcher in two different ways. One is using a clear curved stand that clips onto the inner face of the ring, which props the Watcher roughly at hip height from Master Chief, and the other is using a small kickstand than unfolds from beneath the ring, setting the Watcher at what would be ground level. 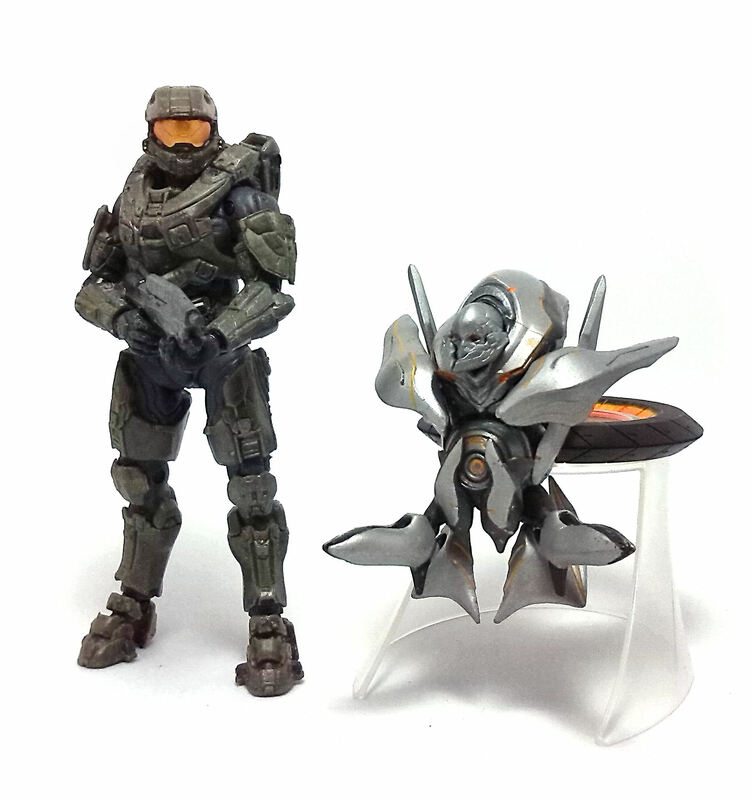 Clearly, neither option looks impressive enough for display purposes alongside other figures in this line, except maybe combined with the Promethean Knight Deluxe figure also made by McFarlane Toys. You’ll see, the Watcher can fit onto the Knight’s back, after taking away the repulsor ring, which is consistent with the way these two units interact in the game, where Watcher performs reconnaissance duties for the larger unit. 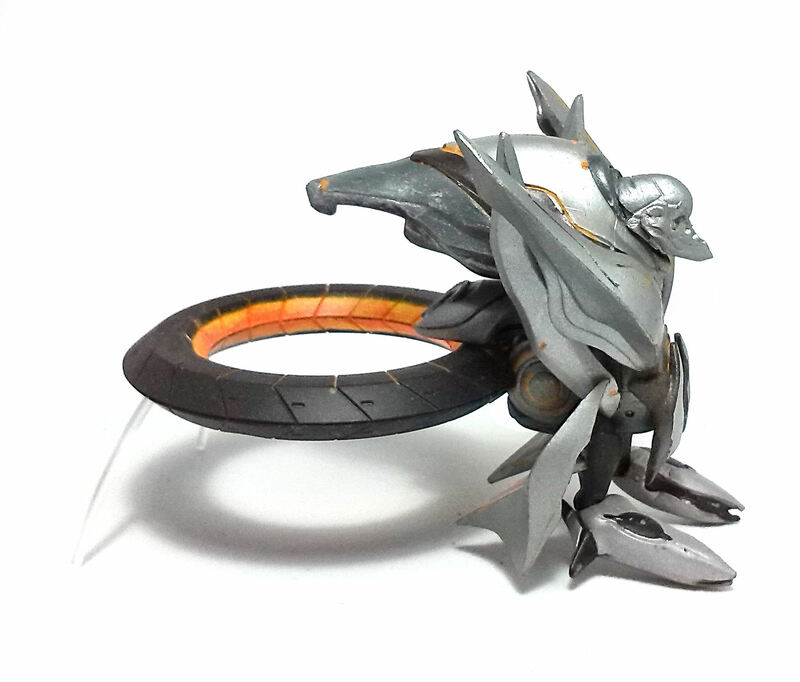 However, since at the moment I do not possess the aforementioned Promethean Knight, I can only rate this figure for what it is, and that is not much. At best, this Watcher feels like an accessory pack for the larger figure and with that in mind, I am no longer sure that even at 50% Off the original price this was a good deal.